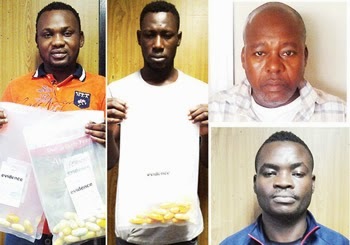 Four drug traffickers Ejiofor Eliezer (46), Obah Francis (30), Akpa Sobuzochukwu (27) and 36-year-old Ike Okechukwu all pictured above have been arrested by officials of the National Drug Law Enforcement Agency, NDLEA, after they excreted 171 wraps of drug that tested positive for cocaine at the Muritala Mohammed International Airport. According to Punch, the men were apprehended during the screening of passengers on board Qatar and Emirates airlines enroute to Brazil. One of the drug traffickers, Eliezer, who excreted 100 wraps of the drug, when interrogated, said poverty pushed him into the illicit business. Another trafficker, Francis when interrogated said he ventured into drug trafficking to boost his meager salary he makes from his bakery job in Brazil. He said he would have made N2.8 million if he had succeeded. Sobuzochukwu who holds a diploma in accounting, swallowed 26 wraps and was paid S1,500 i.e N285,000. According to NDLEA Chairman, Ahmadu Giade, they would be charged to court soon.